Richard Bach is an American writer who wrote some bestsellers in the 1970s, including “Jonathan Livingston Seagull” and “Illusions: The Adventures of a Reluctant Messiah.” I very much enjoyed these as they are chock full of wise quotes that can be applied to everyday life. I don’t know when Bach first wrote these wise words, but I do know the first time I saw them was in the mid-1980s while I was stationed in Georgia — and even then it wasn’t the actual quote, but another version some redneck had altered. I recall the day I first read it while bass fishing with one of my Army buddies. He had a shirt that said, “If you love something, set it free; if it comes back, it’s yours; if it doesn’t, hunt it down and kill it.” That version was funny at the time, while the accurate version seemed a little corny. daughters and helping them navigate the drama of dating and breaking up in high school. When I struggled to find words to console them, I knew I could always reassure them by saying, “If you love something, set it free; if it comes back, it’s yours; if it doesn’t, it never was.” I said those words, but I thought the other version because I really wanted to hunt down the snot-nosed punk who hurt my little girl’s feelings. I saw the original quote again recently on a greeting card, and I couldn’t help but think about those early Army years and the time I first saw the altered version on my buddy’s t-shirt while bass fishing. Back then, when I wasn’t working, I hunted and fished every chance I got. 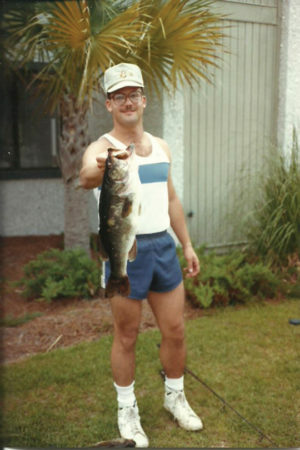 I especially became hooked on bass fishing, and my only goal at the time was to catch a “hog” larger than 10 pounds. Although I came very close several times, the biggest I ever caught was a 9 pound, 8 ounce slob. I also caught a whole bunch of fish in the 7 to 8-pound range. Yippee for me. It was nice to brag about those fish then and it was even cooler driving around the Army base showing my large female dead fish to all my buddies because, I’m embarrassed to say, I kept every one of them to mount, to eat or both. We all did back then. I know. Some of you are thinking, “Blando — you actually kept large female spawning bass? Didn’t you believe in catch and release?” If you asked me today, I would say, “Of course I do!” But it was different back then because neither I, or anyone I fished with, had ever heard of catch and release — just like we didn’t know about quality deer management (QDM) then either. 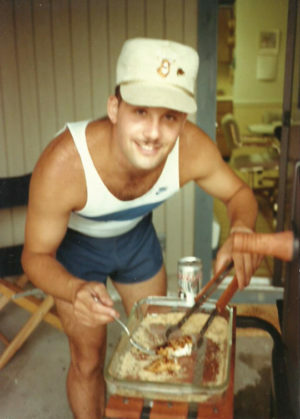 In 1988, I was proud to bring the fish in the pictures below home to my fiancée. It might be hard for you to get beyond those glasses I’m rocking, the goofy hat or those dorky shorts, but take a look at the series of three pictures. In the first picture, I’m holding a large female bass in the 7-8 pound range. In the next, the one with the sinister look on my face, I’m cleaning the fish that should still be swimming around laying eggs. And in the final picture, I’m posing for my future wife with a “see what a great provider I will be” look. We never thought about the future back then. We only thought about bringing home the big one to show family and friends, catching enough fish for dinner, and stocking our freezers for future meals with fish of any size. Fortunately, times have changed for the better. My research indicates the practice of catch and release started sometime in the 1950s – but I don’t think I ever heard the term until some time in the 1990s, and even then it seemed to be something that only musky fisherman were concerned with. I read somewhere that a female largemouth bass will lay between 2,000 and 7,000 eggs per pound of body weight. Do the math and that means a 7 to 8-pound bass, like the one I kept in Georgia, would lay somewhere between 14,000 and 56,000 eggs. I’m still kicking myself for keeping that fish. I’ve had similar experiences with walleye. One of my fondest memories was an ice fishing tournament in the late 1970s on Pewaukee Lake. Fishing with my dad and brothers was always memorable, but this particular day remains very vivid because my dad took the top prize with an 8-pound walleye he caught on a Beaver Dam tip-up. We had that one mounted and probably ate the fillets as well. Now I don’t know how many eggs a female walleye lays, but the Wisconsin DNR website indicates an average of around 50,000. Had we let that fish go, we’d probably still be fishing for her great-great-grandfishies today. Today, most fishermen I know let these spawning females go. Please don’t think I’m judging you if you keep them. As the Gospel according to Matthew says, “Take the plank out of your eye before you try taking the speck out of mine.” Lord knows, in regard to this subject, I have multiple planks in both eyes, so I certainly won’t begrudge you for keeping large spawning females of any species. Unlike 30 years ago, I now practice “catch and release,” at least for any large females and even small ones if they have a belly full of spawn. I love fishing and I love to catch large fish and I’m guessing most of you feel the same. I know that the odds are good that if I let these fish go, they will come back. Maybe not that specific female fish, but she will return in the form of her offspring and her offspring’s offspring and her offspring’s offspring’s offspring and so on and so on. I also love my kids and will love my future grandkids and I can help ensure their fishing futures by only taking what I will eat and releasing those fish that will produce future generations for them to catch.